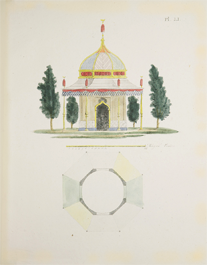 This is the 1819 edition of a highly popular model book depicting various kinds of garden follies, sculpture, gates, bridges, and furniture as well as sample layouts intended to inspire garden patrons and designers during the Romantic era. It features 190 engraved and hand-colored plates portraying faux hermitages, rustic huts, Chinese bridges, classical temples, and many other ornamental structures along with prototypical garden plans. Written in Dutch, it includes a full English translation of the text and captions by landscape historian Vanessa Bezemer Sellers. Click the appropriate link below to access the version that is compatible with your computer’s operating system. This short introduction by Vanessa Bezemer Sellers provides useful commentary regarding the pop-up translations of the original Dutch text. It can be viewed in PDF format in your browser or downloaded to your desktop. This companion essay by Vanessa Bezemer Sellers offers an in-depth historical explanation of Dutch landscape design and discusses the importance of Van Laar’s model book for both amateur and professional garden makers in the Netherlands in the early nineteenth century. It can be viewed in PDF format in your browser or downloaded to your desktop.